This story appeared in the Monday, May 18, 1914, Charles City Intelligencer. Mrs. Jackson Wood, a well-known resident of west Kelly Street, met with a very serious accident last Saturday afternoon while downtown shopping. 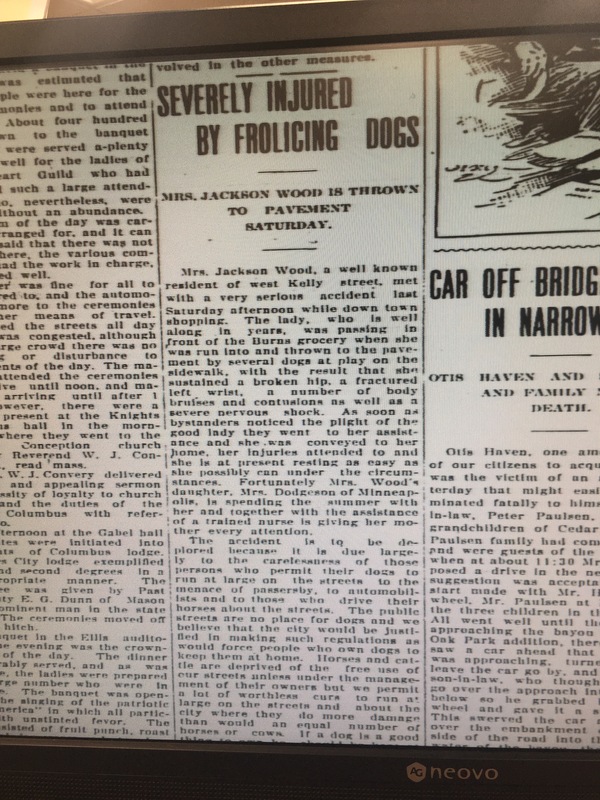 The lady, who is well-along in years, was passing in front of the Burns grocery when she was run into and thrown to the pavement by several dogs at play on the sidewalk, with the result that she sustained a broken hip, a fractured left wrist, a number of body bruises and contusions as well as a severe nervous shock. As soon as bystanders noticed the plight of the good lady they went to her assistance and she was conveyed to her home, her injuries attended to and she is at present resting as easy as she possibly can under the circumstances. Fortunately, Mrs. Wood’s daughter, Mrs. Dodgeson of Minneapolis is spending the summer with her and together with the assistance of a trained nurse is giving her mother every attention. The accident is to be deplored because it is due largely to the carelessness of those persons who permit their dogs to run at large on the streets to the menace of passersby, to automobilists and to those who drive their horses about the streets. The public streets are no place for dogs and we believe that the city would be justified in making such regulations as would force people who own dogs to keep them at home. Horses and cattle are deprived of the free use of our streets unless under the management of their owners but we permit a lot of worthless curs to run at large on the streets and about the city where they do more damage than would an equal number of horses or cows. If a dog is a good thing to own, he should be kept at home where he can be looked after by the owner. This entry was posted in Charles City and tagged dogs, History. Bookmark the permalink.